Rang De Basanti is a Bollywood drama and motivational film which is directed and produced by Rakeysh Omprakash Mehra. Aamir Khan, Siddharth Narayan, Soha Ali Khan, Kunal Kapoor, R. Madhavan, Sharman Joshi, Atul Kulkarni and British actress Alice Patten are in the lead roles. The film was released globally on 26 January 2006, the Republic Day of India, it received critical acclaim winning National award for most popular film and it is also rated as 8.4 out of 10 on IMDB which is one of the highest among Bollywood films. The movie is very famous by his motivational dialogues, story and other area. 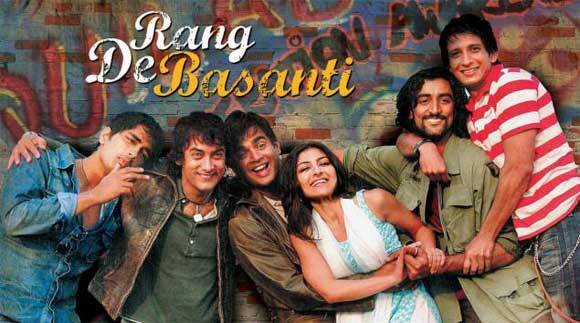 Rang De Basanti got Best Movie at the Filmfare Awards. The film was declared "Blockbuster" by Box Office India. Here I have collected some best dialogues of this movie. In movie many inspirational dialogues are delivered by many actors like Aamir Khan and other actor. The movie got good response by audience and critics. So I am sharing some beautiful and movivational dialogues of Rand De Basanti Movie. I Hope, You will like my post.
" College di gate de is taraf hum life ko nachate hai ... te duji taraf life humko nachati hai "
" Ek pair past mein hai teh ek pair future mein hai ... Tabhi toh hum aaj pe moot rahe hain "
"Mujhe hamesha lagta tha ki duniya mein do tarah ke insaan hote hain ... ek joh chupchap maut ka daman thaam lete hain ... aur doosre joh rote chilaate maut ki taraf badhte hain ... aur phir main teesre kisam ke insaanon se mila "
" Koi bhi desh perfect nahin hota ... Usse behtar banana padta hai "
" Baap ka paisa hai ... pade pade sadd jata hai "
" SMS generation ... char liney zyada kya bol di lecture lagne lagta hai "